Job seekers can send in a Cisco application for a chance to work for one of the most successful American multinational technology companies. Founded back in 1984, Cisco Systems, Inc. is now one of the Fortune 500 companies with up to 72,000 employees worldwide. Each department at Cisco Systems Inc. abides by a schedule type that enables it to comply with its main requirements and perform its activities properly. Job seekers will be notified of the schedules of their chosen careers during their interviews with the Cisco hiring specialists. According to the company’s hiring policy, all candidates for Cisco employment must be at least 18 years old to be deemed eligible. Please note that all younger candidates will be automatically eliminated from the selection process. They are advised to apply for Cisco Internships instead. Job seekers interested in Cisco employment need to go to the company’s official careers portal to find the complete list of available positions. They will be able to select the career department they would like to work in, as well as the location of the position they are interested in. When they find a Cisco career they want to be considered for, they will have to fill out the online jobs and employment from featured on the company’s portal. They will be asked to create an account on the portal to do so. This is the first section of the Cisco application form. Users can upload their CVs to have the portal automatically extract relevant information from the document and use it to populate the relevant sections of the form. Please note that the data-fill tool is optional. Candidates may also fill out the Cisco job application manually if this is more convenient for them. For this section of the Cisco application, candidates must provide their contact details. For this section of the Cisco application form, candidates must provide their main contact details. The Human Resources department will use this data to identify them and then to contact them regarding the following steps of the hiring process. Please note that the fields in this section are labeled as mandatory. For this section of the Cisco application form, candidates are required to add information about the highest level of education they have achieved. They will have to select the type of degree they have earned and the name of the issuing university. For this section of the Cisco application, candidates must provide information about their academic and professional experience. Most Recent Job – The Cisco application form required candidates to list the job title they have had in their most recent position, as well as the name of their former employer. Level of Experience – Candidates are instructed to list their level of experience for the Cisco job application from. Certifications – Applicants are asked to list their Cisco or other industry certifications. They may also include details about other certifications that they might have. Former Employment at Cisco – Applicants who have been previously employed by the company will have to mention their User IDs, their employment status, and their employee number. Fluent Languages – The Cisco application form requires candidates to mention the languages they are fluent in. Their language skills could recommend them for a wide range of positions with the company. 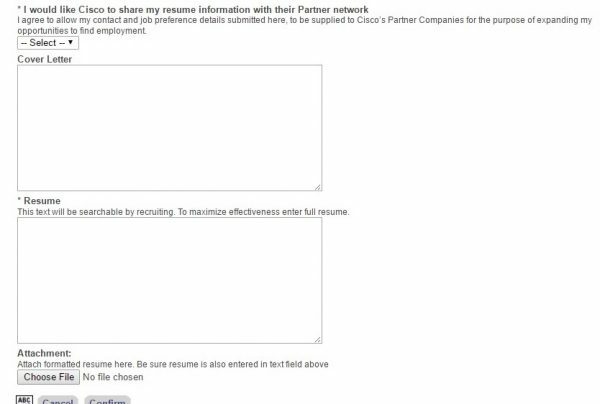 Cover Letter – For this section of the Cisco application form, candidates are required to type or paste in their cover letters in the provided space. This format makes the content easier to use by the HR specialists. For this section of the Cisco application, candidates must provide information about their resumes and cover letters. Resume – Candidates must also upload their resumes to the Cisco application. They will be required to paste in the text in the provided section, as well as attach their CVs in their preferred format to the following field. This is the Cisco job application that we have described above. The information provided by the candidates to this section will remain saved onto their profiles. They can then use it to apply to other Cisco careers on the portal. 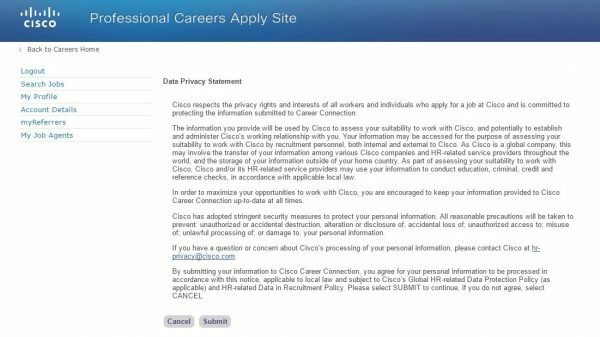 For this part of the Cisco employment profile, candidates are required to read the company Data Privacy statement. At the end, they will have to certify that they agree to the terms featured there or that they do not. Candidates must read the Data Privacy Statement before they submit their Cisco application. For this part of the Cisco employment profile, candidates are required to read Article 23A which refers to the licensure and employment of persons previously convicted of one or more criminal offenses. They will have to certify that they have read the document and that they fully understand the terms included in it. Job seekers will find the updated list of Cisco job opportunities on the company’s online employment portal. They will be able to select the career department they are interested in, as well as their preferred location to find the best possible jobs. Students and young professionals can apply for internship programs at Cisco to find out first-hand what it is like to work for one of the most successful multinational technology companies in the world. They will learn from some of the most highly trained professionals in the business and they will develop practical skills that they can later use in their careers. Cisco salaries for interns are typically negotiated during the interviews with the hiring specialists. They begin at $16.00/ hour but they can get as high as $41.00/hour depending on the applicants’ professional skills. Job seekers interested in Cisco careers in management will find the full list of available careers on the company’s online portal. They will have to send their application online to be considered for their chosen careers. Cisco benefits packs are meant to meet all the main needs of the employees. The company offers generous health and financial benefits, as well as competitive Cisco salaries and performance-based bonuses. The exact structure of the Cisco benefit packs will be determined according to the careers of the employees and the duration of their collaboration with the company. The Cisco application form is quite easy to fill out because it features a relatively low number of sections. It is essential that candidates have access to the updated versions of their resumes to complete the form. They can also use the data-fill tool provide on the profile to complete their forms quicker. This tool will transfer the relevant information in their CVs to the appropriate sections of the form. Applicants may also opt to fill out the form manually. It should take them up to 45 minutes to complete the form. We strongly recommend that they take their times with their cover letters. They should try to include original information about themselves and avoid the stuffy standard formats. Rather than listing the main details of their resumes, they should point out what makes them interested in working at Cisco, as well as the most important personal features that make them valuable candidates. Candidates should take the time to proofread the information they include in their Cisco applications. They can correct spelling and grammar mistakes by using the spell checking tool provided on the portal. However, they should also make sure that there are no data inaccuracies in their applications. If they decide to use the data-fill tool, they should make sure that this has transferred all the information correctly and completely. After they submit their Cisco job applications for assessment, they should remember to go to their profiles and complete the Data Privacy Statement and the Article 23A tasks. On their profiles, they will be able to see the Cisco jobs they have applied for (in the My Submittals section). This way, they can keep track of their application status. 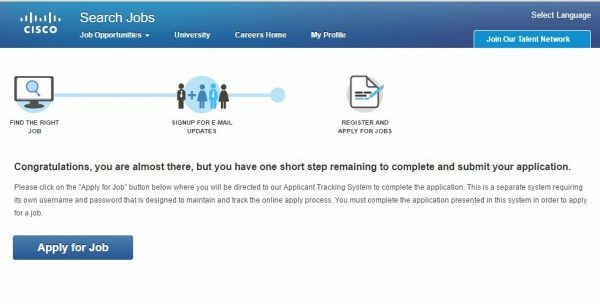 Candidates should know that they are allowed to apply for multiple positions on the portal. Each of these Cisco careers will be included on the portal. The Cisco hiring specialists will assess all the employment applications to find the best-suited candidates for each of the open positions. 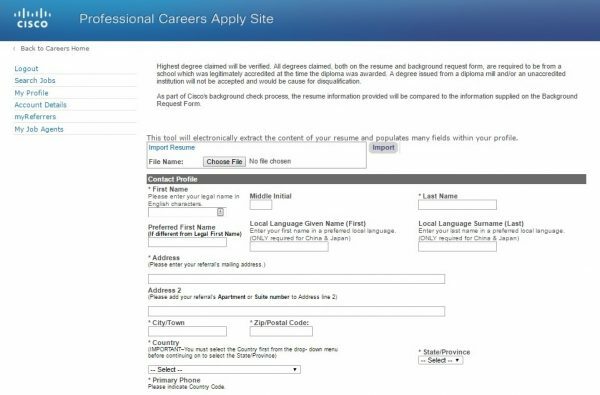 The selected applicants will then be called in for the interview process, which may include several job meetings, according to the career level and the department chosen by the candidates. At the end of the interview process, the company’s hiring managers will provide them with their final answer. Candidates preparing for their interviews are advised to do their research about the company. They should know about Cisco’s most important achievements, as well as the main types of products and services they offer. They should also make sure that they are able to point out what makes them professionally prepared to meet each of the requirements of their chosen positions. This will help them provide complete interview answers and make a good impression on the Cisco hiring specialists. We have selected a few sample interview questions that can give applicants an idea of the tone of the Cisco interview. They can answer these questions for practice because this will help them improve their performance at the actual job meeting. Why have you applied for Cisco employment? What makes you prepared to meet the responsibilities of your chosen Cisco career? What do you know about Cisco? How well would you say you are at managing your time? What do you think you can bring to the Cisco team? How well do you work as part of a team? Do you prefer to work individually or with a team? What can you tell me about yourself that is not included in your Cisco application? I will be a retired elementary teacher and am wondering if its possible to start a career at Cisco in their on-site childcare program???? ?